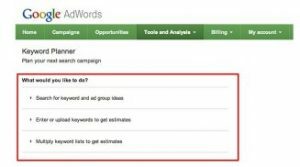 Before you start working on your Google Adwords campaigns you’re going to need a Google Adwords account. You might be tempted to dive right in and set up the account without really giving it much thought, but that’s a mistake. Before you start we recommend that you work through the following tips to help you get started off on the right foot. A Google Adwords accounts allow you to create multiple campaigns, as many as one thousand in fact, but it’s a good idea to think about how you’re going to organise the campaigns before you get started. You might want to organise them based on location, season or grouped into products or services, the way you organise them is completely up to you but as campaign budgets are set at the campaign level it’s important to know what your campaign structure will be. Set up your ad groups for each of the campaigns you’re creating. This is another way of categorising your campaigns that will help you to be organised from the start. Your website can be used as the base for the way you organise your campaign structure and ad groups. Work out your ad targeting wishes and set them up. Choose whether to target the Search Network, the Display Network or remarketing. Research your keywords so you’ll be using the terms that are used by your customers. Select the keywords to focus on based on the volume of search, the relevancy of the keywords, the market click cost and the paid search competition. It’s also important to add some negative keywords as these work to save you money. The negative keywords stop your ad showing in search queries that aren’t relevant to your campaigns. Set the keyword match types. The options are: broad match, broad match modifier, phrase match, exact match and negative match. Writing the copy for the ad is the final step. The ad content needs to be compelling while being very easy to understand so that people will want to click through. Spend some time on the ad copy and create a call to action that is unique to your business. There are additional steps that we recommend working through, such as setting the mobile bid allowance and making use of the Google ad extensions, but these six Google Ads tips are a great starting point. Click here if you’d like to speak to us about our PPC services and discover how we can help with Google Adwords.